I know it’s to be expected in commercial yarn….but darn it….knots are infuriating! I am working on the heels for my Big Bang Vanilla Socks and I hit a huge knot. My heel yarn is some Deborah Norville Serenity Sock. It’s a nice soft workhorse yarn. A lot like Knit Picks Felici and the colors don’t bleed like some other commercial mainstream brands. I was knitting in bed last night (hence the bad flash photography on my comforter) and decided to put this WIP in a mini timeout until I decide how to deal with the knot. PB has been on hand for the heels. These heels were ready about the same time the 4 week growth spurt hit. So PB has needed a little extra attention and tummy to tummy time from mommy. Luckily I have found a relatively comfortable and ergonomic position to knit while snuggling a baby. We both stayed warm and cozy listening to music or podcasts while the heels grew and grew. And sometimes you just have to stop and enjoy the baby snuggles before they are gone! 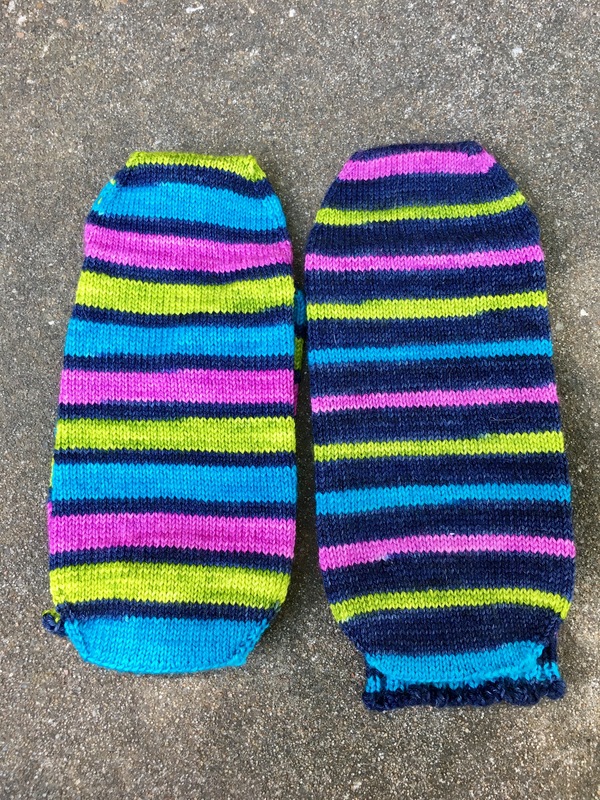 My Electric Mayhem socks are now two complete tubes waiting for heels! I have been using these as my bedside knitting. I can knit in the dark while PB sleeps and I hide for some self care time. I love my family and boy howdy are my kids loved by some many people…but I have had visitors at my house pretty much non-stop since the week we came home from the hospital. And that’s just a lot for a sleep deprived mom of two. These socks have been very therapeutic for me. I get some alone time and make progress on some pretty amazing socks. I measured and cut in for my afterthought heels on both socks. 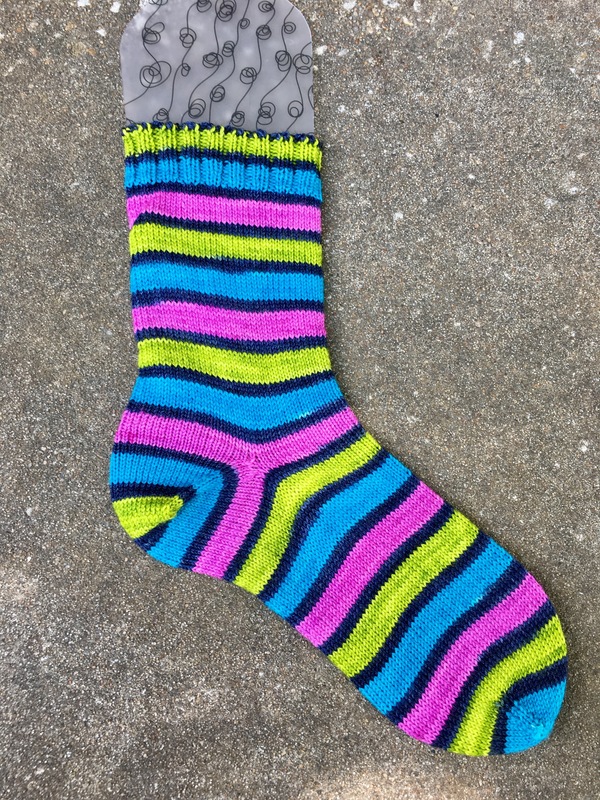 By popular vote in my house….I have listened to the masses and chosen to stick with the black sock yarn from Joanns for my heels. I briefly flirted with purple heels but ultimately came back around to black. Now I just need some uninterrupted knitting time (with light) to knit both heels and I’ll have a FO! Unfortunately, my time at work turned out exactly as I knew it would…..sooooo many meetings. 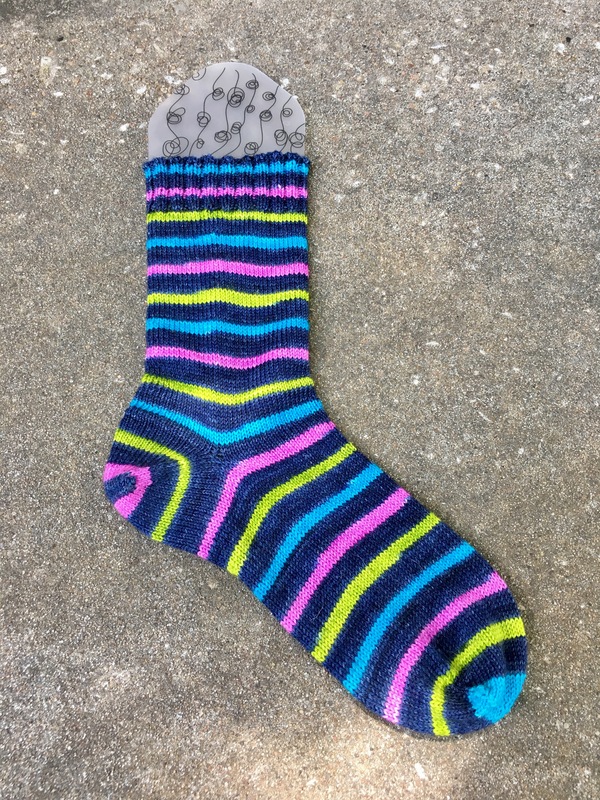 But I was able to finish my Smooth Operator Socks! Even the end are woven in! Overall, I was very pleased with this project. The heels did in turn out to have no gaps and fit moderately well. (Full disclosure, I have devised my own personal afterthought heel recipe that I absolutely love the fit of…so there as a high bar to clear.) Both socks match remarkably well if I do say so myself! The yarn was extremely nice to work with and I think will stand up well to the abuse that socks tend to take. The pattern was helpful and well written, but what else do you expect from Susan B Anderson? I did try these on…and my legs and feet are now 34 weeks pregnant. They don’t fit badly but they don’t make my feet feel head over heels in love. Like my Accidental Travel Socks, I think I will tuck these into my drawer for fall and test them again post-preggo legs. They are just a bit tight here and there. If I don’t end up liking them or their fit, well, they can just go in the Christmas box for my sister! The toes are installed on my Accidental Travel socks…squee!!! I literally cannot put these down. Jellybean hasn’t been very consistent about sleeping and PB is growing like a weed making it not easy to find a comfortable pregnancy position. These socks have been like salve to my soul. Who needs sleep when you can knit pretty yarn? Today I’m going to cut in the true afterthought heel and try to get them knit up. I do a little bit of my own flavor of afterthought heel that adds the depth I need for my foot/heel. I’ll try to remember to put notes on my Ravelry page on what I do. If I work a heel like a “standard” toe its NO WHERE NEAR deep enough of a pocket to fit my foot.